Kaplan's Medical Assistant Exam Prep provides the in-depth content, comprehensive review, and targeted practice you need to pass the Certified Medical Assistant and Registered Medical Assistant exams. Whether you're a first-time test taker or you're studying for recertification, Kaplan's up-to-date content and proven test-taking strategies will help you face the exam with confidence. 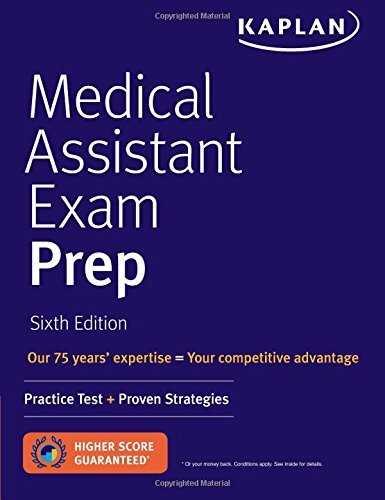 Kaplan is so certain that Medical Assistant Exam Prep offers all the knowledge you need to pass the exam that we guarantee it: After studying with the book, you'll score higher on your medical assistant exam—or you'll get your money back. The previous edition of this book was titled Medical Assistant Exam Strategies, Practice & Review with Practice Test.